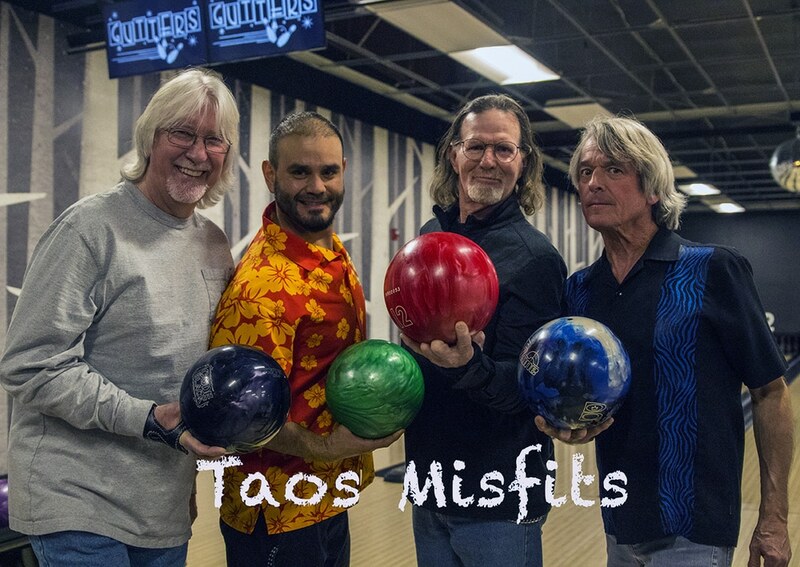 Editor’s Note: News to Me is a new column that will run on a regular basis at livetaos.com, providing news and commentary about the latest and greatest Taos has to offer. For a long time, there’s been this woeful call echoing through Taos Canyon: We need a bowling alley. Something family friendly. Something affordable. Something locally owned and operated. Something that fills the activities calendar gap for so many locals. I had heard about the call of for a long time, but it wasn’t until recently that I caught wind of the answer. Shelly Ratigan, a Taos County resident for the last 33 years, and others, are the ones who have provided the answer. And they’ve done it with no small measure of awesome. Ratigan is a savvy businesswoman. Before opening Gutters, she started the Northside Health and Fitness Center in El Prado. When she was 35 years old, she stood in her driveway and flipped a coin: “Heads, I open a gym; tails, I open a bowling alley”. And while the outcome was heads, the idea of starting a bowling alley never fully went away. In fact, she sold the Northside recently to get the capital to begin work on Gutters. Not only that, but Ratigan has also done her homework. She did two full feasibility studies, and found that the population in Taos County could support a 12-lane bowling alley. She wrote a complete business plan, including a high level of investment and an exit plan. And she hasn’t gone into this alone. She’s gone into business with her college roommate and longtime friend, Deanna Minato, and Dave Kullowatz, Johnny Long and Diahann Cordava. 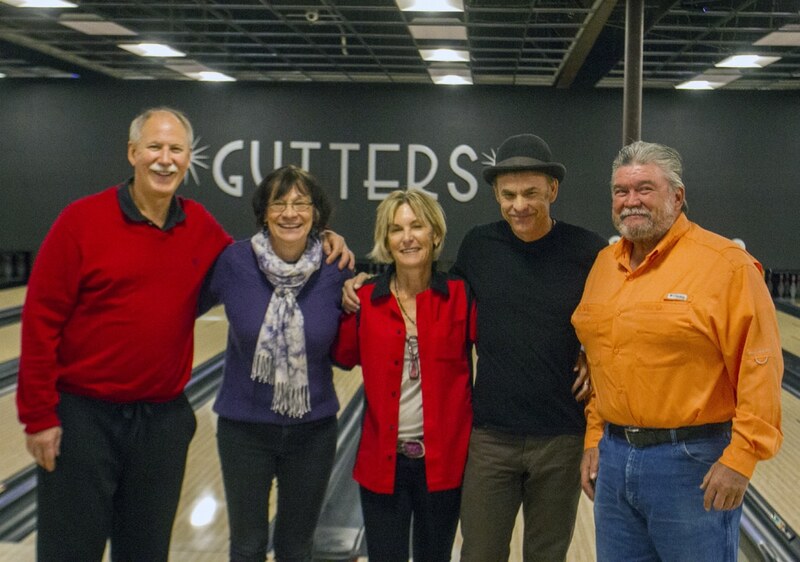 The soft opening for Gutters took place on Dec. 26, with a subsequent grand opening on Jan. 9. 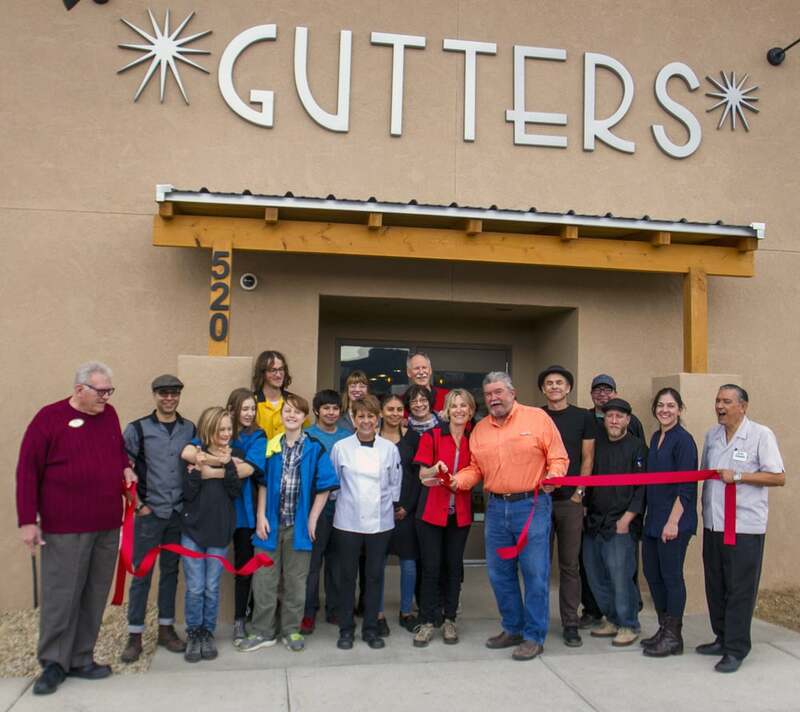 As the mother of a 16-year-old daughter and a 13-year-old son, Ratigan has always envisioned a family friendly, fun, affordable, healthy environment at Gutters. From the start, the alley is fulfilling much of that vision. For example, sitting at her home office desk months ago working on the Gutters business plan, she had a day dream: What if, at some point, all 12 lanes were taken up by birthday parties? Recently, wonderfully, she looked up to see 12 birthday parties in all 12 lanes at once—and got chills. Ratigan is also a responsible business owner. She is keenly aware of the delicate intersection in Taos between a family friendly environment and one that serves alcohol. She has made it a priority from the start to have a full menu served in the bowling alley, to help ensure that customers are eating while they’re drinking, and she ensures that all of her employees have passed responsible beverage service training with flying colors. She even surveys her business to see to it that everyone is having fun — responsibly — and works with a local safe ride company to make sure that when someone does possibly have too much, they get home safely. Ratigan has a lot of ideas about how to keep those 12 lanes busy. There are fall and winter leagues, starting Sept. 1 and Feb. 1, respectively. She foresees senior and junior leagues, bowling together one night a week, for 2 ½ hours of bowling. Leagues can also help local businesses with teambuilding for employees. She is working with local schools, senior centers, and businesses to put together a team schedule, and with UNM-Taos on a 1-credit physical education class in bowling. In the meantime, there are women’s, men’s, and mixed leagues who each bowl weekly, getting that rare blend of healthy competition and comradery. But let’s talk about the design. If there were a Modern Bowling magazine, this building would be on its cover. The sleek, modern design of the building inside and out is credit to Ben Curry of LDG Architects. Not only did he design a sleek, adobe building just east of the Youth and Family Center on Cañon East, but he also helped design the interior. For instance, the soft, angular grey-and-white wallpaper with trees down either side of the bowling alley was Curry’s find — from Sweden. And local artist Sarah Hart designed the contemporary Gutters logo. The smooth, white chairs, glittery rainbow bowling balls, and chic orange couches create a clean, uplifting, beautifully designed space for bowling and community. Ratigan pays attention to all of the details. If bowlers prefer a busy, packed atmosphere, she recommends bowling at night, when Gutters is full to overflowing. If a quieter atmosphere is preferred, then bowling during the day may be more enjoyable. 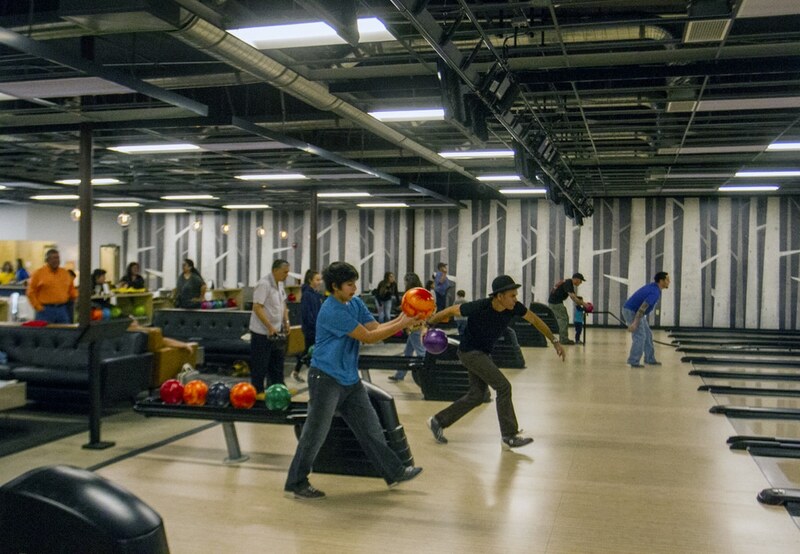 During the week, it costs $22/hour for up to 6 people to bowl on one lane. On weekends, it’s $25/hour, and during Cosmic Bowling on Friday, Saturday, and Sunday nights, the price tag is $27/hour. Shoe rental is $4 per person. The menu at Gutters is extensive and includes “bowling bites,” tacos, wood-fired pizza, burgers, salads, and more. Beer and wine are served as well. Down the line, Ratigan envisions developing another 4,000 feet of her current building into an arcade, with pool tables and retro arcade machines. Ratigan’s son, Ezra, named Gutters. She was brainstorming for weeks before he had an “aha” moment in the car one day, in the parking lot of the El Prado post office. Over the year and 10 months it took to build Gutters, Ezra noticed his mother’s business acumen. That, in and of itself, is enough to come see the beautiful puzzle Ratigan has put together with the help of many. Then, to stay and bowl a game or two. So, I’m a little behind the eight ball — or, in this case, the bowling ball. But I’m so happy that there is a modern, family friendly, fun bowling alley in Taos Valley now, one with an incredibly thoughtful businesswoman at its helm. Initiatives like this give me hope. They remind me, we’re in this together; we’re a community in the truest sense of the world; and now, here, we can experience healthy competition and comradery, all in one.